Virtual Reality. If it rather feels like we’ve been here before, then that’s because we have. Promising hardware - check; impressive demos - check; the games industry at the forefront of the technology - check again. For those too young to remember or brains to pickled to recall, VR was as big a deal back in the early 90s as it is right now. Public interest was high thanks to the 1992 film The Lawnmower Man and it wasn’t too long before we got a chance to taste virtual reality ourselves in video arcades thanks to British company Virtuality. The only trouble was, once we’d paid our fiver, donned the helmet and got caught up in the cables, it didn’t even take the ludicrously short three-minute experience to work out that, in actuality, VR was rubbish. There were other reasons why the first coming never made it. It was clunky, it was expensive, it wasn’t even suitable for the arcade, let alone something you could access in your own home. Its biggest crime of all, though, was probably that nobody behind it realised the need to manage our expectations. The world was disappointed with VR, interest waned, funding ceased and, along with it, the development of the technology. All life powered down. Jump forward 25 years to the present and VR is back along with all that hype that it had before. Spearheaded by legendary Kickstarter wearable the Oculus Rift, it’s a prospect that has both gamers and developers licking their respective screen-faced chops, and why not? Google ‘Oculus Rift’ and you’ll find YouTube bursting with open-mouthed reaction videos of VR gaming’s latest converts. The big question behind those screams of joy and leaps in-game horror is whether or not these kinds of techno-awe are going to have any staying power? Is VR going to make it this time or will history be repeating itself only with nicer graphics? There are three essentials for any emerging tech looking to cement its place in human culture. The hardware needs to be smooth, the applications have to be compelling and the implementation of all of it has to be practical. Even on its own, Oculus Rift has already looks like it’s taken care of much of this. Its latest developer kit sells at a very reasonable $350, and that makes it practical because the technology is actually affordable. It’s less than the price of a games console and one would find it hard to complain that you’re not getting much in return. The motion blur and judder that could easily make you feel sick is eliminated, thanks to the response speeds of the OLED displays for each eye, and latency issues have been all but vanquished which would otherwise cause a difficulty to process delay in what you’re seeing and what you’re doing. It’s the kind of technology that kept such head-mounted displays at costs of over £30,000 and solely for military purpose back in the 90s, but it’s been the rise of the smartphone industry since that’s made this all possible at the regular Joe kind of level as the CEO of Control VR, Alex Sarnoff, explains. 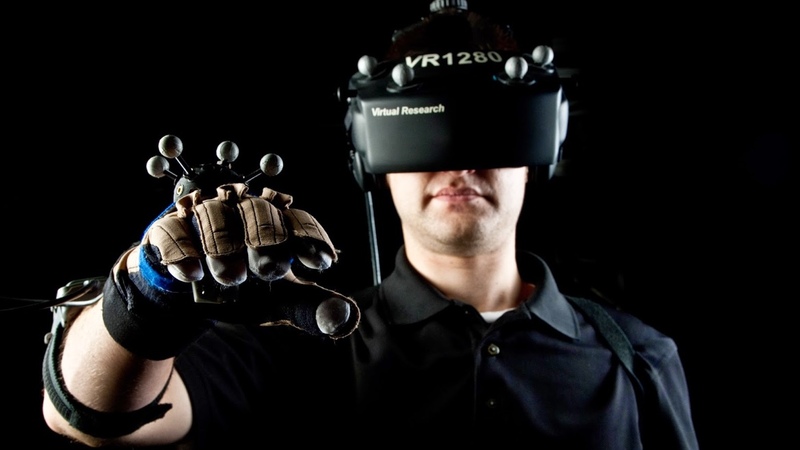 The low cost parts and high end development point towards something slick in the headgear department available on a mass market level, but while vision and sound alone might be enough for VR to get a foothold, we have another three senses to tend to in order to complete the experience - and that’s where the Control VR gaming glove, another crowdfunding success story, comes in. “The fact that is that, right now, for the first time in history with the Oculus headset, we have a low-cost HUD that is able to give the viewer an experience that is so close to feeling like you are in an environment that you’re not,” Alex Sarnoff, told us. “It’s not there yet. There are many challenges still just on the headset but it’s at least given us signs of life that we’re getting close to solving one part of the industry, which is being able to see, but, ultimately, to be fully realised, we’re talking about having all five sense in VR. “So, what we’re doing at Control VR is looking to address the other most important sense of - not only this idea of presence and seeing your own body - but being able to interact and have feedback too so that touching something in the virtual space genuinely feels like you’re actually touching it in reality. While we can safely put tasting and smelling on the back-burner as unlikely barriers to VR’s success, the idea of touch is going to be a tricky one and quite how vital it will prove to be for VR lift-off is difficult to predict. On the input side, things look good. Getting your body involved in the scene is easy enough. Motion capture has been developed in the movies over the last decade and, again, both the smartphone, a latterly, wearable industries have been making inertial sensors and trackers far cheaper and more convenient to get hold of at price befitting the consumer. Where things start to get into the mind melting area is when it comes to haptics. That dog that Sarnoff speaks of - how coarse are its hairs; how long are they; are they greasy; are they hot or cold? Exactly how large is does this vocabulary of touch need to be? Where do you even start given that it’s a subject of development so far behind and so much more complicated than the AV space? “What we’re trying to solve is creating a computing platform that is so powerful that it’s able to convince the human brain that it’s experiencing something that it’s not,” Sarnoff explained. “If you think about what a technical challenge it will be to develop a toolset to actually be able to do that in a way that’s complete - it will be the most incredible accomplishment, technically, I believe, of mankind up until that point. “What we want is everything. We want it to be as real as possible. That’s the goal. For now, what will we bring is probably the first language with the first sensations of at least having an impact with something. But the idea of being able to feel hot, cold, greasy; that is the end goal of what we're trying to accomplish. For the first real killer applications of VR, though, it’s unlikely that we’ll need to suit up completely. What Oculus, and its first flush counterparts, need to achieve is a gaming experience that’s significantly better and sufficiently compelling compared to what’s around at the moment. With over 180 Oculus Rift-supporting titles in the pipeline, virtual reality is clearly something that the developers think of as a pretty good bet. One such game is the multiplayer dogfighting shooter set in the EVE: Online universe. Originally, just a project at developer CCP Games EVE: Valkyrie was shown off to the franchise’s fans at their Fanfest event and simply exploded from there. “CCP are going for it as a company; we’re just going for it,” outlined Valkyrie’s lead 3D artist, Andrew Robinson. “If no one believed in VR, then we wouldn’t make content for it but we feel passionate about it and so do other people, and we want to make a great VR game and VR experience. A quick watch of the most recent Valkyrie gameplay trailer and, even on a normal, flatscreen monitor, it’s not hard to imagine the added excitement that all the magic of VR could add. Robinson and his colleagues had been testing out Oculus Rift and how it might benefit games for quite some time and through a process he terms, “rapid prototyping”, quickly discovered what works and what doesn’t. Some quick sketchy animations in a white box environment is all it took to give things a go with minimal time and effort in bringing the trials to fruition. “Initially, there was a mixture of experience and pot luck,” he said. “The things that you expect to work won’t always work and things that you think will absolutely never work often come out great. If they worked, we kept them and turned them into something, or we scrapped them. “Either they didn’t work or they made people feel strange and we just got rid of them, we chucked them right there. There’s no rulebook for VR. People who are developing for it right now are creating it. CCP’s way of getting around this issue is by creating an experience in Valkrie that is purely cockpit-based. It doesn’t require the complicated haptics and multi-sensory environment that Alex Sarnoff described and it keeps the need for interaction under fairly tight control too. You’re sitting down in the game and you’re sitting down in real life. “We’ve seen this world start to grow up around VR with treadmills and head tracking and all theses different things and I think they’ll become very viable in the next couple of years,” explained Robinson. So, if the necessary hardware is all but months away and some compelling sounding content with it, then what is there standing in the way for virtual reality’s entry into actual reality’s everyday life? Robinson’s answer for the final ingredient is, ironically, the very one that caused the crash of the VR wave back in the 90s - public interest. It’s possible that VR’s immersion gaming may prove to be a fad but it certainly feels more relevant and exciting that the prospect of 3D ever did; and that’s made it to millions and homes and cinemas all over the world. Facebook didn’t cough up $2 billion to get involved for nothing….